ca 485 - 480 B.C. Side A: Duel of Paris and Menelaus (see other image). 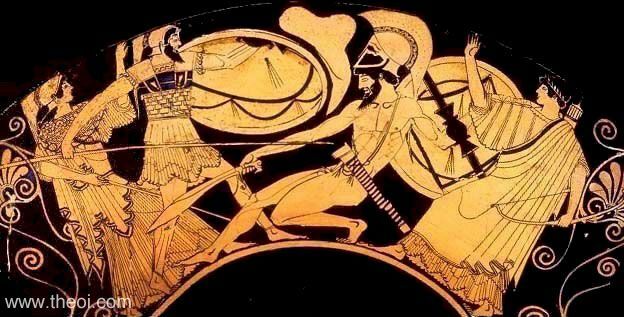 Side B: Ajax (Aias) battles Hector in a scene from Homer's Iliad. Each of the combatants is supported by a god--behind Ajax stands Athena, wearing a helm and the aegis, and behind Hector stands Apollo, holding a bow and crowned with a wreath of laurel. Tondo: Eos with body of Memnon (see other image).